In May 2006, President Oscar Arias of the National Liberation Party (PLN) assumed office, defeating principal rival Ott�n Solis of the Civil Action Party by roughly 2% of the vote. Arias has listed passage of the Dominican Republic-Central American Free Trade Agreement (DR-CAFTA), along with fiscal reform, infrastructure improvements, furthering education, and improving security as primary goals for his presidency. The 57-member unicameral Legislative Assembly has five principal party factions, with the governing party, PLN, having a 25-seat plurality. 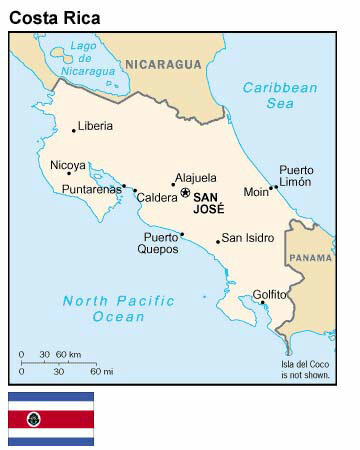 Costa Rica has oil deposits off its Atlantic Coast, but the Pacheco administration (2002-2006) decided not to develop the deposits for environmental reasons. The country�s mountainous terrain and abundant rainfall have permitted the construction of a dozen hydroelectric power plants, making it largely self-sufficient in electricity, but it is completely reliant on imports for liquid fuels. Costa Rica has the potential to become a major electricity exporter if plans for new generating plants and a regional distribution grid are realized. Mild climate and trade winds make neither heating nor cooling necessary, particularly in the highland cities and towns where some 90% of the population lives.